[Breaking News] DarkEdge UI Now Available to the Public FREE! Discussion in 'Android News' started by wuyanks, May 9, 2010. A few weeks ago, I privileged to sit down with Android developer, Xeudoxus, for an interview. 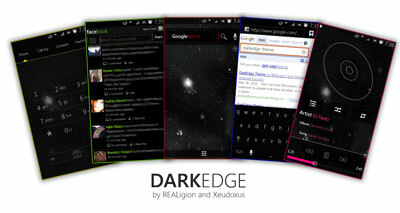 As you all may know, Xeudoxus and graphic designer ReaLigion have been diligently working on DarkEdge, an ESE81-based theme that promises innovations Android has never seen. Over the past six weeks, the DarkEdge theme was locked in a Private Beta, which was the source of a bit of controversy among the Android community. However, if you have seen the leaked screenshots or partook in the Beta, you are aware that the theme certainly lives up to the hype. So now, I have breaking news to share with everyone. *DRUMROLL*. I am proud to announce that DarkEdge is moving out of Private Beta status, and is being released publicly, free of charge! That’s right. As promised in my interview with Xeudoxus, you will have full access to DarkEdge at no charge, as of tonight! Furthermore, DarkEdge will be calling DroidForums.net home! All support, developing, updating, will be provided here on DroidForums.net. The DarkEdge Beta for ESE81-based ROMs has been updated frequently over the past few weeks, and Xeudoxus promised over 30 additional fixes and updates for its public debut. The “Beta” designation has been dropped. The entire system is themed according to a dark minimalistic approach, including a brand new lockscreen, innovative notification bar and pulldown, transparent phone dialer, and much much more. Nothing was omitted from being themed! In addition, quite a few apps have been themed for the initial Public release: Beautiful Widgets, Buzz Widget, Facebook, Google Voice, Google Finance, Gtasks, HandcentSMS, Maps, Market, Pandora, TechWidget, Twidgit, and Twitter. Another goodie, to which I’m sure many of the Beta testers were already privy, is that DarkEdge will be available with an option for five different colors! Those not a fan of the original goldish-yellow highlights, you will also have the choice of green, red, blue, and pink! Koveleski is heading up this endeavor, and will have all colors ready by the end of next week. Koveleski mentioned that blue will be available later tonight! Red will be released next, then Green/Pink. An anonymous tipster mentioned that other colors may also be in the works, but I am not sure how accurate that rumor may be. Finally, if all this wasn’t enough for the Android community, Xeudoxus has been working overtime to port the DarkEdge theme to Koush’s CyanogenMod. DarkEdge for CM will also being made available publicly for the first time today. Do note, however, that CM’s version is still in an alpha stage, and not everything may look perfect, or work as smoothly as the ESE-81 version of DarkEdge. So without further ado, check out DarkEdge Beta for yourself in Xeudoxus’ section! You will be amazed!! i have been waiting for this! Thanks! How does one go about installing this new theme?